The S&P 500 is trading above the key 1,400 level and on track for a 12% gain for the first quarter, but ETFs that invest in the basic materials sector and copper are flashing weakness. The $1.8 billion Materials Select Sector SPDR Fund (NYSEArca: XLB) is actually down 2% over the past month, while iPath Dow Jones-UBS Copper ETN (NYSEArca: JJC) is also in negative territory with a 3% decline. Some technical analysts watch materials and copper ETFs to gauge the health of the global economy. In the past, a lack of upside follow-through by the basic materials sector and copper has been a sign that the economy lacked strength going forward, says Chris Kimble at Kimble Charting Solutions. 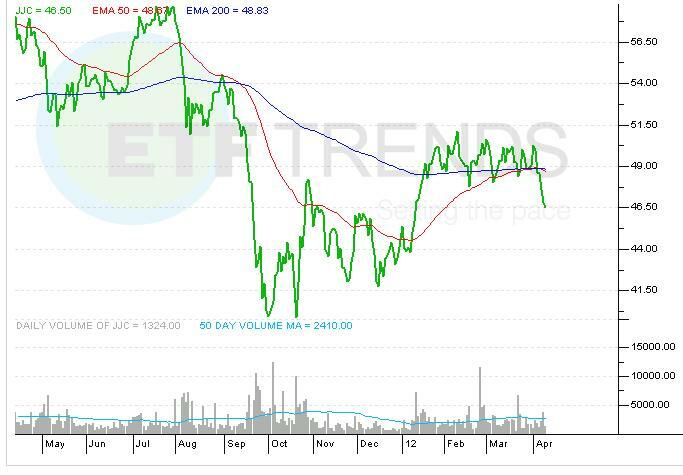 More recently, weakness in top holding Freeport-McMoRan (NYSE: FCX - News) has weighed on the materials ETF. Other funds in the sector include iShares Dow Jones US Basic Materials (NYSEArca: IYM), Focus Morningstar Basic Materials (NYSEArca: FBM) and Vanguard Materials (NYSEArca: VAW). Full disclosure: Tom Lydon’s clients own FCX.